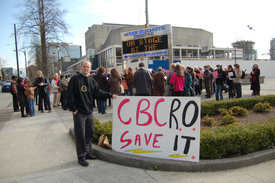 Depending on who you believe, somewhere between 100 and 200 people gathered in Vancouver today to protest the axing of the CBC Radio Orchestra. 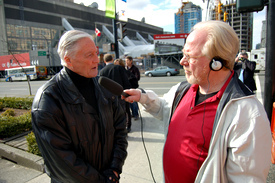 Tod Maffin from InsidetheCBC blog posted some photos (copyright protected so I can’t post them here) on Flickr, including one of former CBC Vancouver regional manager and one time head of Radio Music Robert Sunter being interveiwed by Paul Grant. Tod’s article at InsidetheCBC says 100 people were there when he was there about 15 minutes into the demo. Meanwhile, CBC.CA says 150 people. Proving once again that there is a reason people go into journalism: accountancy is out.